As you know from viewing the treehouse, the stone circle, and our amazing lavender, The Husband loves projects, the bigger the better. The stone circle, especially, is so immense he’s been working on it every summer since 2011. Believe it or not, two parts of the stone circle are not quite finished. 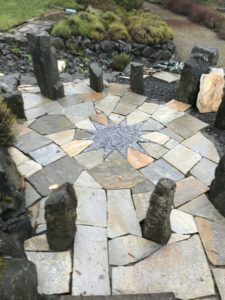 For a long time, The Husband been planning a concrete star for the lower portion, and with the help of his faithful sidekick, Christina Concrete-Carrier, this autumn we (mostly) completed it. So many of you dear readers love these projects, I made a series of videos for you so you can follow along. 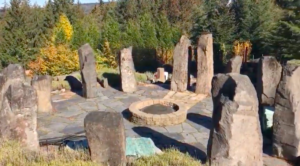 Video #1 takes you on a walking tour, with commentary, of the stone circle, explains what he intends to do, and you get brief glimpses of the concrete mixer and our garden. It’s the next best thing to being there! In Video #2, you see how we’re hauling the concrete (dyed black) up the steps and pouring it into the form. I was 5′ 2″ when we started. I think I’m about 4’10” now. Kidding! But those buckets are heavy! I don’t know about your husband, but mine consistently underestimates everything. 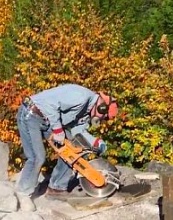 Video #4 is The Husband sawing the stone to fit into the floor around the star. No commentary — it’s loud. We live in Washington state, so far north I can see Canada from my front door. No, really! So our autumn project was interrupted by winter rains, and the finishing touches will have to wait for next year. Even so, it looks pretty good. As you can see, we added glitter to the star. The Husband says NASA can see it from space. You ask — what is the other unfinished area of the Stone Circle? :Sigh: I want a natural looking fountain at the top end that gushes trickles down a stony bed. We’ve had the fountain stone for years, but what can I say? The Husband is wonderful, but he’s a guy, and a pretty fountain is the last thing on his very long list of Things to Do. Cross your fingers for next year, and stay tuned for the finish of the star project in the spring! My newsletter friends have some great times coming up: book releases, exclusive contests and of course, news about The Husband’s latest massive project. Join now!